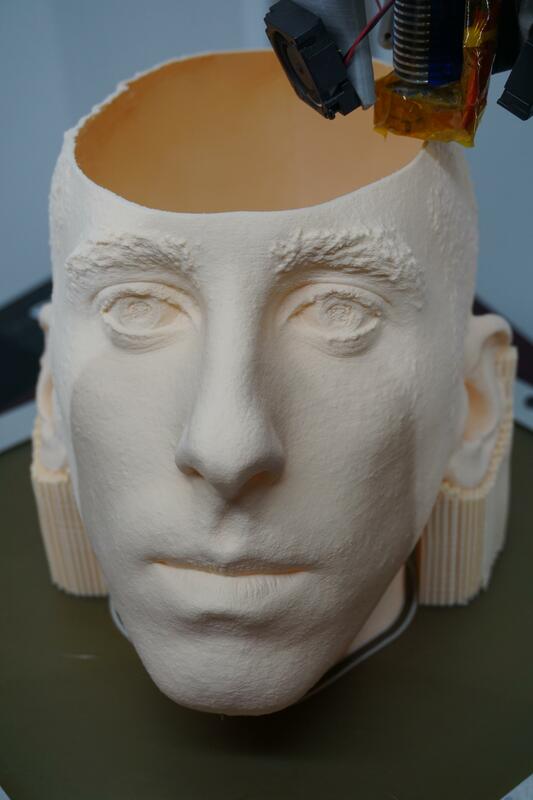 My latest head scan print. I got a pretty good scan done of my brother. It turned out quite well, though the texture of the skin might be a bit exaggerated compared to reality, it is a great test of the detail possible with FDM. PLA, 80 micron layers, 0.4 mm nozzle. Printer is slow, and jerk is set low (480mm/min) so the print time will be 3-4 days. PS I am very sorry, but I cheated… this was done with a Duet 0.8.5 (haven't got a wifi yet to try). Please forgive me. The print just completed. 94 hours total! Wowza! Amazing. You've done some great improvements to the motion code lately it seems, dc42. Thank you. I'm running 1.15-beta3 (2016-07-09). Out of curiosity, is this done with the "vase" spiral mode, or are there more than one perimeters per layer? If it's not a spiral, how did you deal with the seams? Are they running up the back of his head? And what slicer program did you use? Thanks. It was not done with spiral vase mode. There are 3 perimeters, and no infill other than selective solid infill simplify3d puts to maintain shell thickness. Yes, the seam is running up the back. It's pretty small but still visible. I actually sculpted the back and top of his head smooth to help alleviate some suspected problems with the rough hair, so the back is kinda funny looking. Thanks for the info. Now that I have my printer mostly dialed in, I'm looking into slicers and slicing parameters. I was curious how you did it. Nice job. How did you get the scan? That is amazing! The skin is is so detailed! And I can barely notice the print lines! Thanks! It is pretty good, but I'm almost ready to build a printer that should produce even better results… all made possible by Duet. Wow! That's like 8 and a half days - hope you charged the client a lot of money. It was only part of an order, but that part alone was priced at about $650.